Below is a sermon I gave on September 11th 2016, the 15th anniversary of 9/11/01. Good afternoon. It’s so nice to be here at Fellowship Village and I want to open by thanking my friend Phylis Tranotti for the invitation to share my story with you. I also want to thank Reverend Ian for the warm welcome into his home and for coordinating this wonderful memorial service. Finally thanks to Colin and Chris for sharing their musical talents with us. So why am I here today and what is it that I have to say? 8 years ago, on the 7th anniversary of 9/11 I gave a sermon at the First Presbyterian Church of Metuchen, where Phylis and I are both members. It was entitled “September 12th”. It was an honor that our Pastor would yield the pulpit to me on any given Sunday but to allow me that place on the First Sunday of our new program year was in a word, humbling. It was a sermon that he and I had discussed for over a year and a half in one form or another but honestly it was one of HIS sermons that had finally put me into action. It was that sermon that inspired my pen to paper and finger to keyboard. It was that sermon that opened my heart enough to ease the fear of standing before everyone that day and you all today to speak these words. It was that sermon. A sermon entitled “Battle Scars”. A sermon quite frankly I will never forget. He told us to openly bear our wounds and not hide our pain. Share with others our scars and we’ll be rewarded. That it was Christian, the most Christian thing to do in fact, to show our wounds to others much like Jesus did to his Disciples upon resurrection, to demonstrate our faith in redemption. That if we are open and honest to the world that we struggle just like everyone else yet maintain our faith then others will surely follow and seek the same promise. Now when I spoke 8 years ago I told of my experiences on September 11th 2001 and I will do that again today. I followed that story with a message to the audience that no matter what gets you down, no matter what your “9/11” is, that you should always remember that September 12th will come. The sun will set; the sun will rise; and you will be given an opportunity to try again. In each year since giving that message I have shared my sermon on social media and with the world as far as I know how to reach, and I have been blessed and touched repeatedly by those who’ve heard the words and been moved. It’s truly been a gift to my soul. I am so very thankful that I have this opportunity today though to tell the story once more but with slight twist on perspective. 8 years ago my children would not have understood the gravity of my words but today they sit here in this audience, young adults of 17, 15 and 11. And while I again hope that my words may reach far and wide and move people that I may have known through my years, and possibly some I’ll never meet, I’m really doing this for them. So today is September 11th 2016. It is the 15th anniversary of the deadliest attack on American soil. What we all now know simply as 9 – 11. It is a day that is not forgotten across the globe but here in NJ, a place where the towers shadow was once cast, a place that lost 675 residents, it brings a greater, deeper sadness. It is a day I must admit I once begged God to help me forget, a prayer now I am thankful He did not answer. You see I was there that day. Not just in Manhattan. I was there. In the World Trade Center. I was on the last PATH train that let passengers off and it was after the 1st plane had struck. I will never forget ascending from the depths of the basement up the long escalator that took you to the concourse level. I honestly remember thinking to myself “it sounds like something fun is going on up there” For those who don’t remember or know, when you came up to the ground level you entered a shopping mall. They would often have things going on, promotions, or sales. Sometimes bands or music would be playing. I recall that morning was one of the most beautiful we had had and the sky was clear, humidity low and the air crisp. From all indications it was to be a wonderful early autumn day. I couldn’t wait to see what was going on. But as I crest the top of the escalator, I found chaos. Emergency lighting was flashing. People were screaming, running around. It was simply pandemonium. I remember looking in the direction of where the mall entry to tower 2 was and seeing people pouring out. Then in a flash a New York City police officer went running by screaming, “Get out of the building! Get the heck out of the building!! The building is on fire!” Now when a cop yells at you in a sense of panic, it’s probably best to do as he or she says and so I did. As I exited building 4 headed in a southerly direction, imagine my surprise. As I looked out across the sidewalk it was littered with fireballs, very large pieces of what I now know were plane parts a blaze on the ground. I turned and looked up at tower 1 and thought to myself “the building is on fire? That’s an inferno.” I ran south towards Deutsche Bank, which was my employer at the time, and navigated through the debris which upon further inspection included not only plane parts but office items, building parts and things even worse not requiring much detail in this forum. You can imagine. When I got to my office they were not allowing us in the building. Rather we were all congregated on the corner of Liberty and Greenwich Streets. I made a call to Suzi, my wife, to see if she knew what was going on and to let her know where I was. Shortly after ending that call, a very dark shadow passed over where I stood and the world around me exploded with fire, heat, shaking and debris. The second plane had struck directly above and no more than 50 yards from where I stood. I once read it was like a 3.2 earthquake on the Richter scale. All I felt was pure terror. While people watched TV in shock, those of us on the ground ran. It all happened so fast. We did not know what to do, what was next, where to go? You just run. Eventually I stopped with a small group of coworkers outside the Battery Park Parking Garage further down Greenwich Street. Since we were already south of the buildings, we just ran further away in the opposite direction of the towers which turned out to not be a good escape route. We set our stuff down and talked. I tried to call home over and over again with no luck. We watched the towers billow smoke and speculated what was happening. Of course people started talking of terrorism, others weren’t certain. We did not know what to do or where to go. Cars were all stopped. There were people everywhere but the thought of getting further away just didn’t really occur to us. Where would we go? Almost all of the people I was with had arrived on trains that were now under two towering infernos. Looking back at a timeline now, I know that it was almost 40 minutes before this scene would change but in my memory the next part remains so vivid it’s as if it had only taken 5 minutes. At approximately 9:45AM my call home finally rang through. Suzi answered with such nervous anticipation and we were both so thrilled to talk to each other. I explained where I was and that again I was still OK. She told me that I needed to get out of there that they were talking of terrorism on TV. That moments earlier the Pentagon had been hit and they didn’t know what was next. I yelled to my friends and they all gasped now knowing the people pushing the terrorism theory were right. I looked up at the towers and started to explain what I saw and in that moment… I felt the greatest fear I had ever felt in my life. I watched as the top half of Tower 2 appeared to slide off and then begin to pancake. The rumble could be felt and the noise grew exponentially. I saw the cloud of dust and debris start barreling down Greenwich and all I could say was “Oh my God”. I hung up the phone without saying a word, stuck it in my pocket and ran. I ran like I was 15 years old. If I could have fired up afterburners out of my shoes I would have. I hit the mouth of the Battery Tunnel alongside of a friend who dove in an empty police car but I kept running. People were screaming “don’t go in there, don’t go in there. They’ll hit that next.” It didn’t matter to me, anywhere was better than where I was, and so I ran. I remember passing a bus full of passengers who had been apparently waiting in there for over an hour when they had stopped incoming traffic. The looks on their faces were panicked as they saw the crowd of us come flying down past their bus. I had mostly run fast enough and down enough to escape the dust but it was certainly getting thick. We found a crossover tunnel that connected from the inbound side we were in to the outbound side. It was an empty tunnel and had no dust. I jogged and rode on the back of an ambulance like a sanitation worker the rest of the way which if you’ve never been in that tunnel is about 2 miles long. It felt like it was 20. As we got to the other end, an emergency vehicle was just arriving and the First Aiders climbed out to treat those of us first exiting. A man approached me and said “Sir are you OK? Are you OK?” I responded, “I am fine but where am I?” He said, “Oh you better have a seat” and I rather frustratingly said, “NO… I am fine, seriously WHERE am I?” He looked at me quizzically and said, “You’re in Brooklyn”. You see I am very much a Jersey Boy and I must admit that I thought the Battery Tunnel went to Staten Island. I now know the full name of the tunnel is the Brooklyn Battery Tunnel. I wasn’t close to home but I was safe. I walked up to the gas station on the corner and bought two things like any good former boy scout would. One was a bottle of Gatorade and the other was a map of Brooklyn. I did know some folks in the Borough and Suzi reached them via phone and I was able to use my map to find their house. I spent the rest of the day there in shock and watching TV like everyone else in the world and hoping beyond hope to just go home to see my wife, my then 2 year old daughter Alexa and my 3 month old son Jared. The rest of my family had all congregated at my house and we got to talk on the phone. I was assured Alexa had no idea what was going on and that everyone was so happy to hear from me. Eventually the authorities would open up the bridges outbound after 9PM and I was able to borrow a car and make it back to Metuchen. I held Suzi so tight and told her how much I loved her. She told me she had let Alexa sleep in our bed and that I should go see her. As I cuddled up next to my little girl I couldn’t help but pick her up and place her on my chest. I wrapped my arms around her and hugged. She awoke smiled at me, gave me a kiss and said the words I will never ever forget, “Hi Daddy, I saw your castle fall down on TV today” I cried and I cried and held her knowing just how lucky I was to be home. Now while it was important for me to tell you all my 9/11 story it is not the message I want you to take home. To hear that message I need to tell you about my journey of healing from it. For the first two years I denied any problem. But I was angry. Angry with everyone. Angry at the world. Angry with work, it took me there that day. Angry with my wife because I had to go to work so she could stay home with the kids. Angry with New Jersey for being so close to New York. I used to joke I wanted to pick up and move my family to a hole in Nebraska. Everyone would chuckle at me but I meant it. This wasn’t a conscious anger. I didn’t go around yelling at people. More often than not it was subconscious. I was just simmering inside and a pretty miserable person. I had a lot of trouble sleeping and suffered from continuous nightmares. Sometimes in these dreams I was on the front lines of a war where the enemy was shooting planes at us. Other nights it would be more real but this time I didn’t escape the rubble. As the lack of sleep continued I would become even more irritable. By the second anniversary of 9/11 in 2003 Suzi was at a point where she knew I needed help. My selfish pride and the consuming anger wouldn’t allow me to admit that she was right. I made a small effort to talk to my maternal Grandfather, who joined us for this sermon 8 years ago but whose health today, at almost 92 years old, prevents him from being here. The man is and will forever be my hero. He has helped me in every way a grandfather can throughout my life and I have been blessed to have had him be such a part of it. He served during World War II in the 6th Naval Beach Battalion as a medic and was among the first men to hit the sandy shores of France on D-Day. At +65 minutes after the launch of the invasion his landing craft opened on Easy Red Omaha Beach at Normandy and he was one of the many who charged into the fire. If you’ve ever seen the opening sequences of Saving Private Ryan and recall the medic screaming “just give them a chance” as he’s unable to help those dying around him fast enough, than you know the role my grandfather played. I was ashamed to make the parallel since I had run as fast I could away from death and he charged into it but I had heard some of his tales and thought maybe he could help. I asked him, “Will I ever forget what I saw that day?” He answered me honestly and said, “No Justin you won’t. It will fade over the years but you will always remember.” With that I knew that it wasn’t going to just “go away” and after significant resistance I agreed to talk with a professional. I learned of Post-Traumatic Stress Disorder and through about a year of counseling and treatment was able to overcome some of my bigger challenges. Things seemed to be getting better. I started getting involved in the community again and had taken a vocal and active role in trying to shape the direction of our hometown. 4 days before giving this sermon 8 years ago, Metuchen lost a very good friend of mine in Mike Fuccile. He was murdered on his way to work by a schizophrenic patient off his medication and running from authorities and his family. Mike was simply one of the finest men I knew. A super Dad, a great coach, a wonderful husband. He left behind 3 awesome kids and an incredibly resilient wife in Nancy. I have watched them live their September 12th and seen our community rally around them to lift them up. We still remember Mike as a town on each Father’s day by running a 5k with our children and have raised significant amounts of money in his memory to aid those in our area in need. On May 11th, 2010 my family was once again struck by sudden and tragic loss. My brother-in-law, my sister Jackie’s husband, John Zinn, died while on business in Jordan. John was a decorated former Navy SEAL and at the time was serving as CEO of a multimillion dollar defense company that he had formed and founded out of sheer determination and true grit. I don’t know if his work remains classified or declassified or what, but I do know that many men and women who served in the Middle East are alive and well because of his efforts. He left behind two daughters who were 4 and 2 at the time and a wife, my sister, the strongest woman I know, 5 months pregnant with their son Matthew. I’ve watched her sometimes close, sometimes from afar and sometimes just in my mind not only survive but thrive. Not only live her “September 12th“ but to do so in a fashion that would’ve humbled her SEAL husband. The weekend before John flew overseas to Jordan he, Jackie, the girls and I spent a weekend together at their newly purchased beach home just outside Charleston, South Carolina. I was going to be in Charleston the following week on a business trip and it was a great time for us to catch up and for me to lend John some of my handyman skills for a few repairs he wanted to do on the new bungalow. Among other jobs I remember we retiled the backsplash in the kitchen and just had a really nice late spring weekend out on the boat and in the intercostal waterway on which the home sat. At night after the little girls would drift off to sleep and their exhausted and pregnant momma would join them, John and I sat in the screened in porch on rockers drinking beer, smoking cigars, watching the late night boats go up the channel and just talking about life. It was less about the past and more about the future. We talked about our dreams for our careers, our families, ourselves. If it sounds picturesque, movie-like and maybe cliché…it was. John was more brother to me than in-law. I respected him, I looked up to him, and I loved him. 33 years is not enough but he was one of those guys who got his money’s worth out of every day. And so should you. You see you never know when you’re living September 10th. You can’t until September 11th comes and by then, it’s too late. I know I’m not unique in the world for having suffered being so close to instant loss time and again. 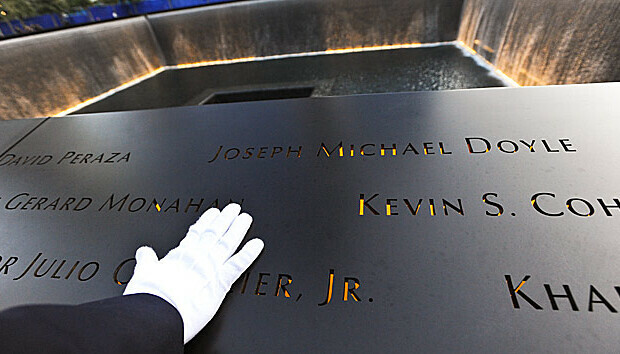 What my mother, sister, friend and families of 9/11 victims have had to endure is much worse. I hope for all of my fellow man that you never have to live through it yourself. I have seen 3 amazing fathers gone in an instant and it has given me the greatest appreciation of life. I try to remember to keep this perspective, but I fail just like everyone else. I say what’s on my mind and what I believe and that’s not always what others want to hear. I say it anyway. I have loved and I have lost and I have survived. I have already done the greatest thing I will ever do in my life. I told you about it at the beginning of this story. Those 3 young adults right there. They are it. And this chapter in the book of my life is dedicated to them. I have no fear if this should be my September 10th for I know Alexa, Jared and Jacob will always have these words, will always have my lessons and will forever have my love. Amen.